THE NEW ASTM D7891 standard will help users undertake shear testing using the Freeman Technology FT4 powder rheometer. ASTM, previously the American Society for Testing and Materials, issues technical standards that are used in the USA and also internationally. The new publication, ‘Standard test method for shear testing of powders using the Freeman Technology FT4 powder rheometer shear cell’, details the apparatus and procedures for evaluating the incipient failure properties of a powder under consolidation. 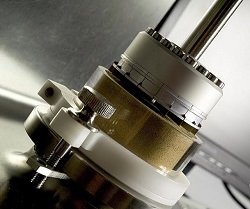 This includes the determination of parameters such as cohesion, unconfined yield strength and flow function. The principles behind all shear cell testers are similar, but Freeman says the FT4 overcomes many challenges by providing an instrument that is easy to operate, with an automated test procedure and intuitive software. The system is optimised to generate reliable, repeatable results, even when working with materials that are widely acknowledged to be challenging or when operating at exacting low stress conditions. In addition to the analysis of shear properties, the FT4 enables users to evaluate dynamic flow and bulk properties in order to understand how powders will behave across a wide range of conditions and in various unit operations. “Shear cell testing is a robust and well-established technique that complements the multivariate approach employed by the FT4”, says Tim Freeman, managing director of Freeman Technology. “The new ASTM standard acknowledges our approach to powder characterisation and recognises the need for reliable and clearly defined methodologies that provide comprehensive and valuable information”.